Donnie Kolb at the Cowboy Dinner Tree, a restaurant along the Oregon Outback route with 30oz steaks. Photo by Gabriel Amadeus. Simply stated, bikepacking is backpacking on a bike. Rather than using touring bikes with panniers, bikepackers use mountain bikes with frame and seat bags that allow them to maintain agility on singletrack trails. And though people have been using bikes to explore trails and dirt roads for about as long as bikes have existed, bikepacking’s popularity has skyrocketed in the past several years with new races and events popping up all over the country and long running events seeing record participation. 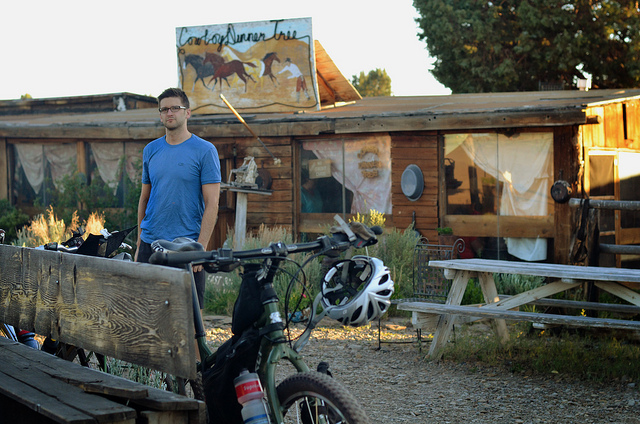 In Oregon, Donnie Kolb is a central figure in the bikepacking world. In his own words he is, “spreading the gospel of dirt and gravel riding throughout the Pacific Northwest.” His website VeloDirt serves as a resource for bikepacking and gravel road routes throughout Oregon, a travel journal for Kolb’s adventure stories, and a hub for loosely-organized, semi-official bike events. In May, VeloDirt is putting on their largest ride yet, the Oregon Outback. It is a wild, 360-mile route tracing most of the distance of the state south to north. I spoke to Kolb about the history of VeloDirt, his love for bikepacking adventures, the unexpected popularity of the Oregon Outback, and the future of bikepacking in Oregon and beyond.